Introduction Cataracts, real public health problem especially in developing countries, are the leading cause of blindness worldwide. Its treatment is surgical AIM. To study the results of cataract surgery by phacoalternative procedure by small incision. Patients and Methods He acted in a cross-sectional study with descriptive and analytical covered with a prospective collection of given over a period of 02 months (18 May to 18 July 2015) in adults at the Ophthalmologic Hospital Saint Andre de Tinré (OHSAT). Sociodemographic, clinical and treatment were evaluated. Result The prevalence of cataract was 17.6%, with a male predominance (59.3%). The mean age was 61.7 ± 12.9 years with the most represented slice of 51-65 years. 95% of patients were in a state of blindness at the entrance. Functional results indicate that 19.9% of patients had good visual acuity without correction (≥3 / 10), 70.1% had a mean acuity (1 / 10- <3/10) and 10% poor acuity ( <1/10). These results improve with the correction TS and pass respectively 44.8%, 49.3% and 5.9%. The main complications were intraoperative capsular rupture (2.7%) and vitreous loss (2.3%). The postoperative complications were hyphema (3.5%) and corneal edema (1.7%). Cataract defined as the opacification of the lens is a public health problem especially in developing countries. Its management represents one of the first priorities of the international initiative ‘Right to Sight Vision-2020’ with a current estimation of 16 to 20 million non-operated cases. According to WHO, cataract is responsible for 60% of cases of blindness worldwide. Cataract surgery rate in sub-Saharan area remains among the lowest in the world, between 200 and 400 operated cases per million of inhabitants against 3500-5000 in industrialized countries. The vision that we can hope to recover from cataract surgery depends both on the state of other transparent media than that of the retina and optic nerve. However, we must remember that any surgery carries a potential risk. Studies in several countries have helped to have an estimate of the results of cataract surgery. Thus, a multicenter study conducted in 15 European countries has resulted in 61.3% of good results. In local and regional literature, few studies have addressed the results of cataract surgery. In Benin, a study conducted in Cotonou noted that 81.3% of patients are in a state of blindness preoperative and 69.6% had good results. We have no recent database in Benin in general and particularly in the northern part, allowing us to evaluate the functional outcomes of cataract surgery. This is what justifies the choice of our work. This was a cross sectional study with descriptive and analytical covered with a prospective data collection. The study took place over a period of 02 months from 18 May to 18 July 2015. - Poor outcome (<1/10): Postoperative VA with and without adjustment <5%. • The corrected visual acuity: it corresponds to the VA obtained after testing the pinhole. -The adult patients operated for cataract who received an intraocular lens during the study period and received a follow up than a month after the operation. - Patients undergoing post traumatic cataract. • A dependent variable in our study was the operated eye for cataracts. • Independents variables were clinical, and therapeutic. Data collection was done by the means of two techniques: a literature review and interviews face to face interviewerinterviewee (e) with the followed patients for an eye examination. Each patient included after the completion of surgery received three ophthalmologic controls: on Day 1 (eye exam and dressing), Day 2 (measurement of visual acuity) and Day 30 (eye examination and measurement of visual acuity). -a search for possible postoperative complications. The collected data were entered using Epi data software. Then they were treated with EPI INFO software (Version 7). The 2010 EXCEL software was used for organizing data in tables and graphs. Comparing the proportions and percentages was performed with the chi2 test (or Fisher’s exact test (test Karl Pearson) as appropriate). For these comparisons probability p <0.05 was considered statistically significant. During the study period from 18 May to 18 July 2015 (2 months), 2126 patients were registered in Ophthalmologic Hospital Saint Andre de Tinré (OHSAT). Out of these, 375 (17.6%) had a cataract. Our sample consisted of 221 (58.9%) patients with postoperative controls carried out for all of them. The turnout was 79.8%. Each patient was operated on one eye. In our series (442 eyes of 221 patients), 322 were diagnosed cataracts. 101 patients (45.7%) had bilateral cataract and 120 patients had unilateral cataract. The right eye was affected in 24% of cases and the left in 30.3% of cases. Laterality of the operated eye In our series, the 322 cataracts, 221 (68.6%) were made (one eye per patient). Figure 1: Distribution of patients according to visual acuity before surgery (Tinré, 2015). Patients operated by ophthalmologists physicians represented a workforce of 123 (55.7%) against 98 patients (44, 3%) for the superior technician in ophthalmology cataract operator. The phacoalternative was the technique performed in all cases with posterior chamber Intra ocular lens in 218 cases (98.64%) and anterior chamber Intra ocular lens in 3 cases (1.36%). All Intra ocular lens were standard power of 21 diopters. Figure 2 shows the distribution of patients according to the VA without correction preoperatively, at postoperative Day 2 then Day 30. Figure 2: Distribution of patients according to the visual acuity without correction in preoperatory, at Day 2 and at Day 30 postoperatory (Tinré, 2015). 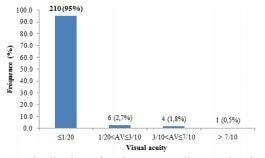 Corrected visual acuity In our study patients with visual acuity between 1/20 and 3/10 after testing the pinhole were the most represented with 101 patients (45.7%) to D 2 and 109 patients (49.3%) to Day 30. Day 30 visual acuity between 3/10-7/10 represented 90 patients (40.7%). Figure 3:Distribution of patients according to the visual acuity with correction in preoperatory, at Day 2 and at Day 30 postoperatory (Tinré, 2015). Figure 3 shows the distribution of patients according to the VA with the pinhole at D 0 and D 2 and postoperative Day 30. Gain obtained by visual acuity class The functional gain in visual acuity at D 2 and D 30 postoperative is shown in Table II. Visual acuity depending on the quality of the operator Day 2 and Day 30 postoperative The quality of the operator influences the improvement in visual acuity (p = 0.011) at Day 2 and Day 30 postoperative (p = 0.031) depending on whether a doctor or a STO. 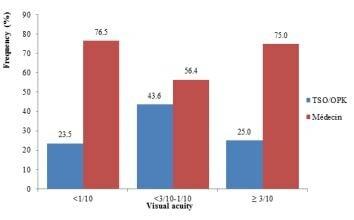 Visual acuity ≥3 / 10 was observed in 77.3% of cases in patients operated on by doctors. Figures 4 and 5 establish the distribution of visual acuity depending on the quality of the operator respectively J2 and postoperative J30. Figure 4: Distribution of patients according to the quality of operator and visual acuity at Day 2 post-surgery (Tinré, 2015). Figure 5: Distribution of patients according to the quality of operator and visual acuity at Day 2 post-surgery (Tinré, 2015). Table I: Post surgery distribution of patients according to the complications and visual acuity (without correction and with correction) (Tinré, 2015). Out of the 375 cases of cataract, 277 (89.1%) patients met the inclusion criteria. Of these, 211 (79.8%) have met the postoperative controls to Day 2 and Day 30 (participation rate). Our results were similar to those of Barañano et al. in 2008 in California, which reported 82% participation rate. In opposite, Addisu and Solomon in 2011 in the southwest of Ethiopia reported a rate of 90% participation, higher than our results for a postoperative check carried out 5 weeks after surgery. An improvement of visual acuity in some patients may lead them to judge useless to return, especially those who live outside of the city where is located the hospital. The frequency of the cataract at OHSAT was 17.6%. At Cotonou in Benin Republic, Doutetien et al. observed a higher frequency of 52% for a study period of about 4 years. This frequency obtained in our study was greater than that of Bejiga and Tadesse in Ethiopia in 2008 which recorded a prevalence of cataract of 3.2%, as well as that of Balo et al. in Togo who reported a prevalence of 8.34%. Patient compliance to appointments for postoperative monitoring has been decreased during the study period from 100% at Day 1 to 79.8% (20.2% lost to follow) at Day 30. The sample size is 221 patients (221 eyes) and the duration of the study period was 2 months probably explain this loss of one in five. Patients with a history of surgery for cataract of the contralateral side accounted for 41 cases (18.5%) in our study. Our results are lower than those of Nangia et al. in 2011 in India, which reported that 64% had received unilateral surgery. Laterality cataract Bilateral cataract represented a workforce of 101 cases (45.7%). Ko et al. in 2012 in China noted a unilateral cataract in 20.0% and bilateral in 80% of cases. Preoperative visual acuity In our series, 95% of patients were in state of blindness and 2.7% had visual acuity between 1/20 and 3/10 at admission. Our findings were identical to those of Mpyet et al. in Nigeria in 2007 and Doutetien et al. at Cotonou, in Benin Republic who respectively reported that all patients were in blind condition before surgery with 100% and 81.3%. Diallo et al. in Burkina Faso reported a preoperative visual acuity less than 1/20 (blindness) in 70.7% of cases and 24.7% had visual acuity between 1/20 and 3/10. Limburg et al. in a multicenter study in India reported that 83.4% of patients had visual acuity less than 1/20 before the intervention (blindness). These high rates of blindness could be explained by the later consultations for patients in developing countries, unlike developed countries where visual impairment caused by cataract impacting the socio-professional activities leads patients to consult earlier. The eye diseases associated In our series, 56.5% of patients had an inaccessible fundus, 43% normal fundus and 0.5% a dull macula. The results reported by Diallo et al. in Burkina Faso showed that the fundus was inaccessible in 81%. These results are superior to ours. Blur or inaccessible aspect of the fundus could be explained by the absence of additional tests such as ultrasound B-mode, what did not have our hospital. Our results allowed us to see that the left eye represented mainly operated with a number of 117 (53.20%) in opposite to 104 (46.80%) for the right eye. Our results corroborate those of Mpyet et al. in Nigeria in 2007 and Jing et al. China that reported a predominance of left eyes respectively operated 44 (62%) in opposite to 27 (38%) for the right eye in Nigeria and 40 cases (48.8%) for the left eye in opposite to 42 (51.2%) for the right eye in China. In Benin Republic in 2006 Doutetien et al. also reported that the operated eye was left in 4.6% of cases in opposite to 37.6% for the right eye and both eyes in 57.8%. These results are different from those of Diallo et al. in Burkina Faso who reported that the operated eye was right in 170 cases (56.7%). In our series, patients operated by ophthalmologists physicians represented a workforce of 123 (55.7%) against 98 patients (44.3%) for the superior technician in ophthalmology (STO) cataract operator. Patients operated by ophthalmologists at postoperative Day 30, had good results in 75% of cases unlike to those operated by the superior technician in ophthalmology cataract operator in 25%. This difference was statistically significant (p = 0.031). Addisu and Solomon Ethiopia reported 71.5% of patients operated by ophthalmologists, 6% by residents and 22.5% of trainees under the supervision of surgeons ophthalmologists. Other authors like Guirou et al. reported that the good results (51.2%) without correction were observed in the group of patients operated by ophthalmic surgeons and with correction (69.3%) compared to those operated by the DES with 34, 9% of good results without correction and 51.3% with correction. • Per operatories complications In total we reported a percentage of 8.7% per operative complications. The most reported complication was posterior capsular rupture in 2.7%, followed by the lens exit in 2.3% of cases. Our results were higher than those of Maneh et al. in 2015 in Togo, who reported 1.89% of intraoperative incidents. Addisu and Solomon in 2011 in the southwest of Ethiopia mentioned that the most frequent operative complications are, posterior capsular rupture in 5% of cases with vitreous loss occurred in 3.9% of which 2 5% received an implant in the anterior chamber. Daboué et al in Burkina Faso, Borzeix et al in Senegal and Ouhadj and Nourim in Algeria noted that the capsular rupture rate is respectively, 3%, 2% and 1.4%. Diallo et al. reported that in their series the most common intraoperative complication was secondary chemosis following anesthesia with 4.67% of cases. The outcome of glazed and subconjunctival hemorrhages was observed in 1.33% of cases. All patients in our series received a posterior chamber implant standard power (21 diopters) with the exception of 3 patients (1.36%) that received an implant in the anterior chamber following the capsular rupture with vitreous loss. 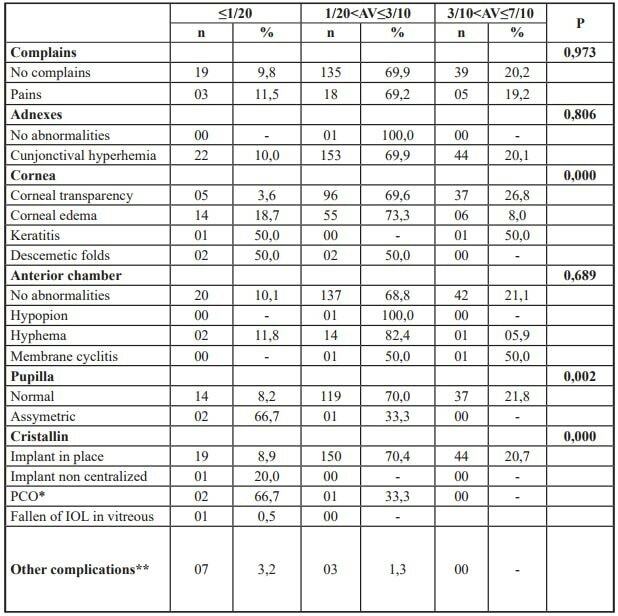 • Postoperative complications at Day 1 and Day 30 On postoperative day 1, the most frequent complications was corneal edema in 34.3% followed by 7.7% in hyphema, iris pigment and lens mass balances in 3.2%. The implant was decentered in 2.3% of cases, descemetics folds were observed in 1.8% and the pupil was asymmetric in 1.7%. At postoperative Day 30, we noticed a decline to 1.8% of the corneal edema, 3.5% for hyphema. The posterior capsular opacification was present in 1.4% of cases. Our results were lower than those of Addisu and Solomon who reported that in south-western Ethiopia the most common complication encountered postoperatively was corneal edema in 71.5% followed by the pupil asymmetric (11 , 7%), the posterior capsular opacification (5%). The implant was biased in 1.1% of cases. Tuskarr et al. obtained in a retrospective study of two (2) years with phacoemulsification as surgical technic; the most common postoperative complication was ocular hypertension (34.5%). Other authors such as Guzek and Ching in Ghana and Yorston and Foste respectively indicated that the main complication of small incision surgery was corneal edema, which persisted at least until the visit of one week in 7% of cases and the loss of the vitreous in 3% of cases against 4.6%. Maneh et al. in 2015 in Togo and Addisu and Solomon in the South West Ethiopia respectively reported a percentage of opacification of the posterior capsule in 3.76% after phacoalternative in Togo and hyphema rate of 4 5% in Ethiopia. Diallo et al. in 2015 in Burkina Faso reported meanwhile that early postoperative complications were dominated by corneal edema with 26.33% of cases at Day 1. Other complications were superficial punctate keratitis with 7.7% and hyphema in 4.3% of cases. At postoperative Day 30 only 2 cases of corneal edema persisted. The pupil was irregular in 8% of eyes at Day 60, and a secondary cataract was observed in 5.33% of cases. In 3.5% of cases there is a fibrosis of the posterior capsule were noticed at Day 30. No cases of endophthalmitis were noted in our series, as well as that of Diallo et al. in opposite to Daboué et al. in 2002 who reported an endophthalmitis rate of 0.3%. A case of endophthalmitis was reported by Doutetien et al. in southern part of Benin. These various complications have significantly decreased during checking carried out at Day 30 postoperative in our series. The differences in these rates with ours might be explained by the earlier examination (after 4 weeks in our case). 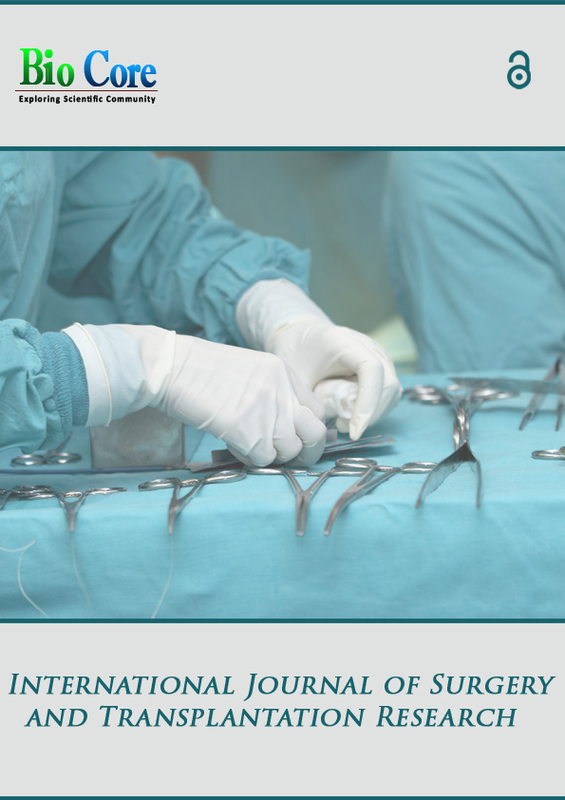 In addition, the relative inexperience of the operators, and lack of adequate and appropriate surgical instruments may have also played a significant role in the incidence of these complications. In our series, at Day 2 postoperative there were 68 patients (30.8%) with visual acuity <1/10 (bad results) uncorrected and corrected 19%. The proportion of patients in the category of average results (AV between 1/10 and 3/10) was 60.2% and 45.7% without correction and with correction. Visual acuity without correction greater than 3/10 (good results) occurred in 9% of patients and 35.3% with correction. At postoperative Day 30, 155 (70.1%) patients had a visual acuity between 1/10 and 3/10 (average results) uncorrected and corrected 49.3% (pinhole). Patients with visual acuity greater or equal to 3/10 without correction were 19.9% and those corrected represented 44.8%. There were 10% of bad results without correction, and 5.9% with correction. This could mean a significant number of patients were visually impaired by cataract before undergone to surgery. Our visual uncorrected and corrected results are below to the WHO guidelines and recommendations rate. The functional results are classified as good postoperative uncorrected if visual acuity is greater than or equal to 3/10 in 80% of cases or less in at least 90% and are corrected bad result in less than 5% of cases. Our results could be better with a good patch of aphakia by the use of implants fitting after calculating their power by biometry. The sutureless technic used in our study is more difficulty to learn than extra capsular cataract extraction with suture and implant posterior chamber (ECCE / IPC). Our results were also lower than those of Diallo et al. who reported that at day 30 after surgery, no good visual corrective result had been noted for 67.83% of and 31.47% had limited results according to the WHO recommendations. These results are respectively 94.4% and 4.9% with best correction. Guirou et al. in 2013 at Bamako indicated that 45.5% of patients had good visual acuity (well) with the correct range, 33% had visual acuity limited and 21.6% had poor visual acuity. With best correction through Pinhole, the proportion of patients with good results increases to 63% and 22.9% of visual acuity limited and 14.1% poor results. Addisu and Solomon reported in five weeks postoperative, 57% good results uncorrected and corrected 70.4% through Pinhole. Their results were limited without correction in 30.7% and 21.8% with correction. The poor results without correction were 12.3% and 7.8% with Pinhole. Maneh et al. in 2015 in a study conducted in two centers in Togo noted that the poor results were 3.76% after-phacoalternative surgery. These results could also due to the presence of suckers who trainees need extended operating time with excessive preoperative manipulation; this could result in the loss of endothelial cells and corneal edema. Causes of poor results have not been investigated in this study and are one of the limits. Guirou et al. reported that causes of poor results were mainly related to surgical complications (42.1%) and refractive error (34.8%). Other studies conducted in Nepal by Hennig et al. showed that their results were bad for 5.5% and of them 0.6% had a preexisting eye disease, 3.2% a refractive defect that can be corrected and 1.7% of complications in surgery. Our results show the improvement in visual acuity with phacoalternative that could be potentiated by the echo preoperative biometry and auto refractometer that were not available at OHSAT. Their presence would have improved visual acuity by calculating the power of implant to use and postoperative optical correcting for each patient. An improvement of visual acuity in some patients may lead to unnecessary judge to return, especially those residing outside the municipality of Parakou and N’Dali. Some authors performed biometrics examination, this is the case of Diallo et al. who noticed that in 59.67% of cases the implant matched the power calculated by biometrics, and in 40.3% the implant was inadequate with a difference ranging from - 5 to + 4 diopters. Guirou et al. reported that calculated implant was unavailable in 1% of cases. Our results are certainly bad but we noticed a high rate of illiteracy in our series. They do not really need a sharp vision to go about their occupation. Therefore patients who improved the performance of their daily tasks after-cataract surgery maintained a relatively stable slightly improved visual acuity. So they drift overall benefit of cataract surgery in their daily lives. Thus Rohart et al. demonstrated in a study conduct in France in patients with cataract and AMD that there was a benefit both in terms of visual acuity and quality of life to operate cataract. Insufficient results (according to WHO standards) were noted in many studies in developing countries. However, in many developed countries the WHO standards were met. This is explained by the fact of surgical techniques. Phacoemulsification is the technology preferred for cataract surgery in developed countries, as several studies have shown that phacoemulsification gives better visual results. This is due in-part to low postoperative astigmatism because of the lack of stitches and a smaller incision size. The manual phacoalternative sutureless surgery is an alternative to phacoémulsification, and is used increasingly in developing countries such as Mali, Burkina Faso and Benin. The good results in our series mainly were observed in the age group of 21-35 years old with 70%. The worst results were recorded in the age group over 65 years old. 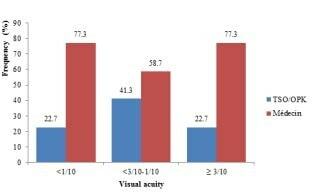 We noticed no statistical link of age on the improvement of visual acuity (p = 0.151). Guirou et al. reported that the worst results are observed beyond 60 years old with and without corrections, the best results being observed in less than 50 years old with and without correction. In our series, at Day2 postoperative, we observed a rate of 63.3% of average results in the group of women and a rate of 11.1% good results in the men group. In opposite men who have average results were with a rate of 58% and good with 7.6%. At postoperative Day 30, we noted a similarity in the results with 22.2% good results in women in opposite to 18.3% for men. Our results differed from those of Guirou et al. who reported that results were good among men with and without correcting respectively with 49.1% and 65% of cases. Good results were observed especially in the group of patients with primary level while poor results were observed in the group of illiterates. However the level of education does not interfere any way statistically significantly in improving on visual acuity (p = 0.157). Cataract remains a leading cause of blindness and brings management problems in developing countries. It surgery by small incision allows an increased fight against reversible blindness due to cataract in developing countries like Benin. It makes it possible to offer quality care to a larger population while reducing the costs of their care. Therefore, an adequate technical support center would be an asset to improved surgical results. Thylefors B, A Naughton, S. Parsley A global initiative to Eliminate avoidable blindness. Health OCUL Community. 2004; 1 (1): 1-24. Lundström M, P Barry, Henry Y, Rosen P, U. tenevi Visual outcome of cataract surgery; Study from the European registry of quality outcomes for cataract and refractive surgery. J Cataract Refract Surg. 2012; 39 (5): 673 -9. Doutetien C Tchabi S Sounouvou Agbahoungba I L L Yehouessi Deguenon J et al The extracapsular cataract extraction, the experience of CNHU- HKM Cotonou. The Benin Medical. 2006; (32): 16-22. World Health Organization (WHO). << Vision 2020: the right to view >>: Global Initiative to Eliminate avoidable blindness. 2006-2011 Action Plan. Fr WHO. 2008; 1-2. A. Hennig Cataract surgery without sutures and without phacoemulsification: a solution to Reduce cataract blindness in the world. Rev OCUL Community Health. 2005; 2 (1): 4-5. Barañano AE, Wu J, K Mazhar, Azen SP, R. Varma Visual Acuity Outcomes after-Cataract Extraction in Adult Latinos. Ophthalmology. 2008; 115 (5): 815-21. Addisu Z, Solomon B. Patients’ preoperative expectation and outcome of cataract surgery at Jimma University specialized hospital-department of ophthalmology. Ethiop J Health Sci. 2011; 21 (1): 47-55. Bejiga A, Tadesse S. Cataract surgical coverage and outcome in Goro District, Central Ethiopia . Ethiop Med J. 2008 ; 46 (3) : 205–10. Balo PK, Wabagira J, M Banla, Kuaovi RK. Specific causes of blindness and visual impairment in a rural area of southern Togo. J Fr Ophthalmol. 2000; 23 (5): 459-64. Nangia V, Jonas JB, Gupta R, Khare A, Sinha A. Prevalence of cataract surgery and postoperative visual outcome in rural central India Central India Eye and Medical Study . J Cataract Refract Surg 2011; 37 (11): 1932- 8. F Ko, KD Frick, Tzu J, He H, N. Congdon Willingness to pay for potential enhancements to a low-cost cataract surgical package in rural southern China Acta Ophthalmol. 2012; 90 (1): 54-60. C Mpyet Langnap L, S. Akpan Outcome and benefits of small incision cataract surgery in Jos, Nigeria. Niger J Clin Pract. 2007; 10 (2): 162-5. JW Diallo, Meda N, Ahnoux Zabsonré-A, Yameogo C, M Dolo, Sanou J et al. Functional outcomes of cataract surgery with implementation by phacoalternative posterior chamber: about 300 cases in Bobo Dioulasso (Burkina Faso). Pan Afr Med J. 2015; 20: 1-10. Limburg H, Kumar RAJ, Indrayan A, KR Sundaram Rapid assessment of prevalence of cataract blindness at district level. Int J Epidemiol. 1997 ; 26 (5): 1049-1054. Jing Y, W Xia, Li-Qin Y, X Qiao Yi-Yan-Ning Y. 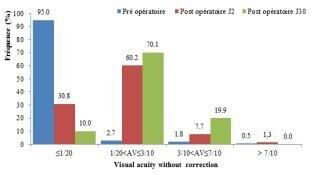 Assessment of visual outcomes of cataract surgery in Xianfeng County, China. Int J Ophthalmol 2015; 8 (2): 292-8. Guirou N, Napo A Dougnon A, S Bakayoko, F Sidibé Sidibé MK et al. Functional outcomes of cataract surgery in adults. J Fr Ophthalmol. 2013; 36 (1): 19-22. Maneh N, M Banla Saa KBN, Bitina GP, KP Balo Surgery of the manual small incision cataract: an alternative in sub-Saharan Africa. Research fr. 2015 ; 2: 1307. A Meda Daboué N, Ahnoux Zabsonré-A, S Diallo, Sanou A. Complications of artificial lens implantation in posterior chamber. Afr Med Black. 2002; 49 (4): 161-5. Borzeix A, C Rivaud Lam A, Ancel J Ruffin X, Faye M et al. Implantation of posterior chamber in black Africa. J Fr Ophthalmol. 1993; 16 (12): 663-7. Ouhadj O, T. Nourim ambulatory surgery senile cataract. Ophthalmology. 1997 ; 11: 258-63. Rohart C, F Fajnkuchen, Buffet S, M, L. Chain Cataract surgery and posterior capsular rupture: prognosis in visual terms and postoperative complications. J Fr Ophthalmol. 2008; 31 (1): 89. Guzek J Ching A. Small-incision manual extracapsular cataract surgery in Ghana, West Africa. J Cataract Refract Surg. 2003; 29 (1): 57-64. Yorston D, extracapsular cataract extraction A. Foster of Audit and posterior chamber lens implant as a routine treatment for age related cataract in East Africa Br J Ophthalmol. 1999; 83: 897-901. Limburg H, Foster A, K Vaidyanathan, GVS Murthy. Monitoring the results of cataract operations in India. Bull Organ Mond Health. 1999; 77 (6): 455-60. Hennig A, Evans J, D Pradhan, Johnson G, R Gregson Pokhrel R, et al. Randomised controlled trial of anterior-chamber intraocular lenses. Lancet. 1997; 349 (9059): 1129-1133.